This is a 10 cm long busked burin from Lenderscheid. It is made of local Quartzite. Diagnostic for Aurignacian busked burin are several parallel bladelet removals (Figure1,2,3,) , that are arranged on a convex (curved) edge. In typical cases, a sort of notch was made near the distal portion of the tool (Figure 1 and 2), opposite the bevel, also seen here. Busked burins are usually seen as the hallmark of a late Aurignacian, at least in S/W-Europe. Maisières, Paviland and Steeden an der Lahn are among the most Northern European Aurignacian sites in a stratigraphic context. 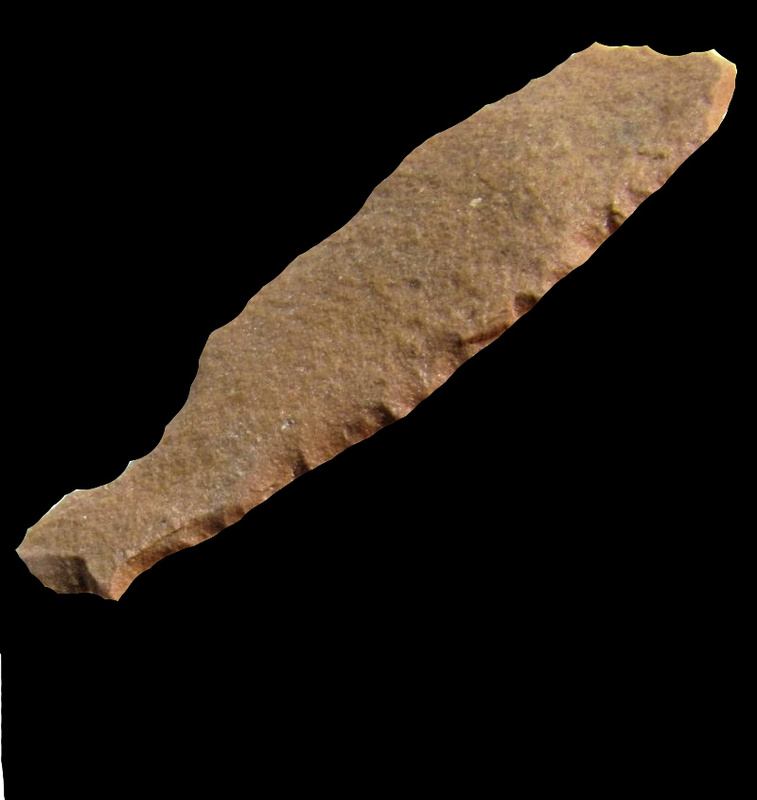 In Northern Hessen, only isolated Aurignacian Artifacts, mostly made from Quartzite have been found. Beside this busked burin, there are several carinated cores in Lenderscheid that point to an early Upper Paleolithic. Some typical Aurignacian items are also present at the Rheutersruh-site near Schwalmstadt within a 15 km distance. Lenderscheid is located at the northern boundary of the Aurignacian oikumene, from which only few sites are currently known. A site at the same latitude, 250 km east from Lenderscheid is the open-air site of Breitenbach (a site of approx. 10,000 m2!) in Thuringia. Breitenbach, which has been excavated since 1924, -the largest Aurignacian open air site in W-Euasia, interpreted as aggregation site. The lithic assemblage comprised carinated and endscrapers but lacking backed pieces. Several C–14 dates (AMS) place the occupations at Breitenbach between 24 and 28 k.a. BP. Using the calpal software, these dates translate into 26 to 31 calendar years ago. Breitenbach is therfore a very late expression of the Aurignacian tradition–the Gravettian has been already established in Central and Eastern Europe at this time. We will certainly hear many news from this site, which has been reopened for excavations ( see attached external links).